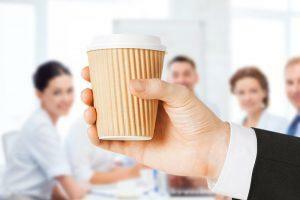 Studies show that workplaces offering snacks and beverages lead to happier employees. These company perks have even been shown to lure employees to new companies. Stinson’s carries specialty coffee and tea items from your favorite brands like Starbucks, Peet’s, and Bigelow. As an authorized Keurig dealer, Stinson’s is your source for K-cup coffee, tea, and cocoa. We even have no cost brewer placement programs when you purchase your supplies from Stinson’s. Do you supply bottled water for your office? Let us do the heavy lifting. We deliver and place your cartons wherever you want them. You probably already stock your breakroom with cups, plates, napkins- all the basic kitchen items. Let us help you simplify your ordering. Combine your regular office orders with all the snacks and beverages that your employees and customers appreciate. Let Stinson’s save you time and money.